I got the message. You really didn't have to call me out on national television, but I see how it is. I'll gladly respond to your invitation to eat and then blog the Pacific Shrimp Taco. I assume you modeled your commercial after my life because you heard about the time I ate 93 shrimp. But, if you're going to spend all that money making a TV commercial can you at least put out a quality product? I wouldn't eat a pacific shrimp taco for $1.19, let alone $2.79! In fact, tonight's dinner consisted of two Pacific Shrimp Tacos and Two Volcano Tacos. The total price of $8.44 was the most I have ever spent on myself at Taco Bell in my life. If you had played your cards right, this dinner combo could have been known as the Nate's Plate special until the end of days, but no. You had to wrap the Mexican-seasoned shrimp in a soft shell. And you had to slather it in a tangy white sauce. Cheap seafood and mystery dairy products together?! I can't believe I drove all the way to the ATM just to get money for such a travesty. I'll give you this, though: When I unwrapped the first Pacific Shrimp Taco, I did catch a whiff of "real" food ... something like Rio Wraps. And when my finger touched some of the orange sauce, it was delightfully spicy. Captain's orders: If you must try the Pacific Shrimp Taco, pass on the sun-ripened mayo, and be sure to treat yourself to an XL Baja Blast. Otherwise, you can keep this one to yourself. I hope you didn't go to the Ferndale Taco Bell, the home of the one-third filled taco. 2.79 price point is pretty steep. Is this a repeat of the burger shot fiasco? YUM is taking a risk on this blog challenge. welp, it was nice knowing you. but i'm pretty sure you are now going to die. 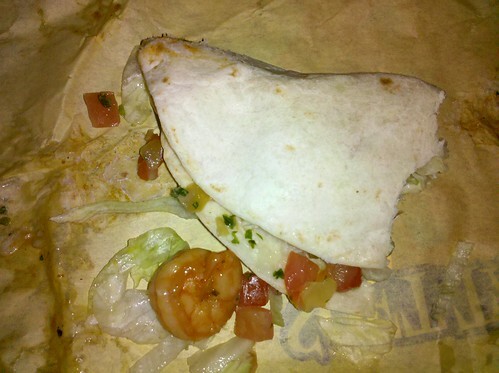 A REAL shrimp blogger would be much much more careful with their shrimp choices than that TacoBell faker! Nate. Dude. That looks seriously disgusting.